Ashley's River Retreat is a comfortable private riverfront home on a quiet riverside street. It is 8 miles downstream from Bull Shoals Dam on the Baxter County (east) side of the White River. It's 5 minutes from Wildcat Shoals Access, 10 minutes to Hwy 62 and Cotter Public river access, and 18 minutes to downtown Mountain Home, Arkansas. Whether your vacation plans include fishing, visiting attractions, or both, our central location is a convenience you'll enjoy! Families, fishing partners, and pets are welcome! New Berber carpeting. New furniture. Sylvania 32" TV with digital satellite reception of all ESPN, HBO, Starz, Showtime, Cinemax, Disney, and hundreds more. Kenwood stereo with 5 disc CD changer, DVD player, and VCR. Telephone with voice mail for local calls. Board games, cards, and poker chips for an evening of entertainment. A sturdy oak dinette set that seats 8 adults. A floor-to-ceiling window behind the table opens a view to the river. Serviceware for up to 10 persons. Buffet service can be set up on the bar between the living room and the kitchen. A rustic chandelier illuminates your table setting should you choose to close the vertical binds. OwnersTodd and Diane Griscom want you to be as comfortable as possible in their vacation home. That is why they furnished the River Retreat with a long list of conveniences ranging from a 21 spice collection in the fully equipped kitchen, to the complete entertainment system featuring a Kenwood stereo system with a 5 disc CD changer, DVD player, and 100s of TV channels. Central heat and air keeps you comfortable any time of the year. Ashley's even has a washer/dryer set for your use. And then there is the river just a few feet away. You can fish one of the best brown trout holes on the river right from Ashley's private bank. Or just watch the water roll by from your choice of an elevated deck, an elevated screened porch, or from a ground level patio. Dine outside on the deck or screened porch. If dining out on the town is your choice, you have several good restaurants within a 15 to 20 minute drive. Ashley's sleeps a maximum of twelve persons. The master bedroom has a queen bed, a ceiling fan, an 8 foot long reach-in closet, a suitcase stand, a 5-drawer dresser, a TV, DVD player, and it's own bathroom with a shower stall. A second bathroom in the hallway has a full-sized shower/tub. An 85 gallon hot water tank ensures there is ample hot water for all. The second bedroom has a queen bed, suitcase stand, a 5-drawer dresser, a five foot long reach-in closet, and a ceiling fan. Between the master bedroom and the second bedroom is a sitting room with a full sleeper sofa, 2 lamps, and a coffee table. Many guests use this sitting room for reading and storing extra gear. The third bedroom has a set of twin sized bunk beds, 4 drawer dresser, and recessed ceiling lights with faders. The sofa seen in the living room photo is a queen sleeper sofa. A washer/dryer set in the hallway utility closet is for your use. The living area has a nice view of the river. You can also enjoy the river from either the deck or 18 x 10 screened porch. Ashley's River Retreat has large front and back yards with outdoor lighting. The front yard, which borders the quiet country road, makes an excellent boat trailer parking area. The back yard, which borders on the White River, has a patio with furniture and a wood burning fireplace. Regulation horseshoe pits, a big swing for the kids, a basketball goal, and a BBQ smoker make the yard a great place for outdoor family recreation.The terrace above the lower yard has another patio. The lower yard is a combination of grass and trees. A sidewalk leads down to the high water mark. You can enjoy the riverfront from both the deck and the screened porch which overlook the back yard and river. The 18' x 10' screened porch has a dinette set with seating for four persons, two ceiling fans, and patio chairs. A frame hammock on the deck makes a truly lazy way to enjoy the whole scene! Full size gas range and oven, dishwasher, microwave, blender, 12 cup Mr. Coffee, 4-slot bagel toaster, electric hand mixer, electric knife, full set of cookware and utensils, glasses, plastic food storage containers. In the hallway is a heavy duty large capacity dryer and a extra large capacity washing machine. 21 cooking spices, flavored olive oils (roasted pepper, basil, garlic, and extra virgin) aluminum foil, plastic wrap, paper towels, bar and liquid soaps, flour, sugar, coffee, Equal, one-quart and one gallon Ziplock freezer bags for preserving your trout catch. Soap, bleach, fabric softener sheets, ironing board, and steam iron. Ashley's River Retreat rents for $275 per night for two nights for the first six persons. Each additional person is $15 per night. For three nights or more, it's $250 per night for the first four persons. Each additional person is $15 per night. (Ashley's sleeps a maximum of 12 persons.) We accept payment by credit card only. A two night minimum reservation is required any time of year except major holiday weekends, which require a minimum three night reservation. Ashley's is open all year. We do not provide daily maid services in the standard nightly rate, but maid service is available for an extra fee of $50 per day. Your Ashley's reservation includes all bed linens and towels. Extra towels are kept in the linen closet. Because most guests prefer a no smoking facility, we ask that you only smoke outside on the porch or deck. Ash trays have been provided there for you. Dogs are welcome with a pet deposit of $100 per animal. Please, no more than two dogs per party! And please, no cats or birds. Your pet deposit will be refunded to you after your stay if any extra cleaning is not required, including any yard waste. You are responsible for cleaning up after your pets. A Super Duper Pooper Scooper is provided for your use. Ashley's requires a deposit in order to hold your reservation. For reservations of five nights or longer we require a deposit of $550. 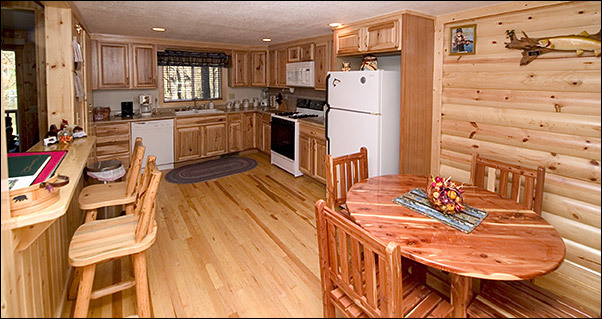 For stays of two to four nights we require a $275 deposit. The balance of your reservation amount is due at check in. We accept credit cards but not personal checks or money orders. We will fully refund all deposits on cancellations we receive within 30 days or more of your scheduled arrival date. Cancellations made within 29 days or less of your scheduled arrival date will be refunded only if we re-book your reserved dates to another party. From Highway 62 in Cotter, Arkansas take County Road 1 north (also called Denton Ferry Rd) approximately 5.6 miles to County Road 703. Turn left on County Road 703 and go approximately 8/10ths of a mile to home with the number 880 on the mail box. � Copyright 2003 the Ozark Mountains Website, Inc. All rights reserved.